We all know that highlighters—whether they're in a powder, cream, or liquid formula—give our cheekbones an extra *boost* whenever light hits them. But what if the luminizer comes in a different shade like violet? Or what if it looks exactly like a rainbow? 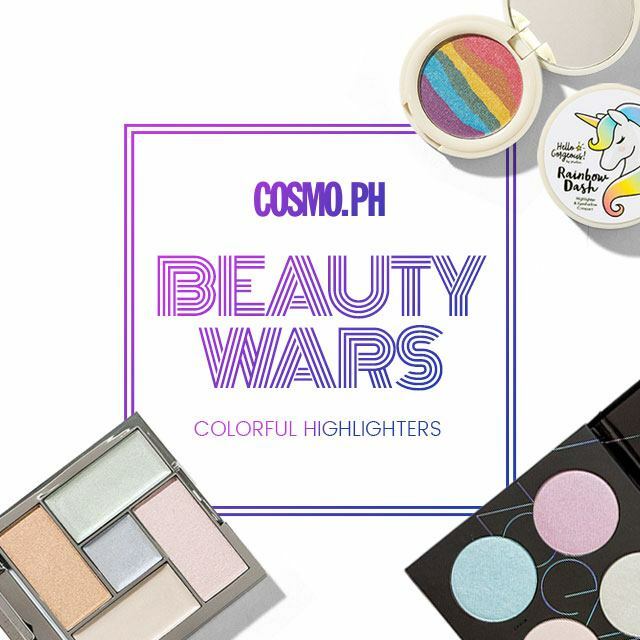 For today's Cosmo.ph Beauty Wars, we're gonna give colorful illuminators a shot. Read on, and be warned that this ain't for girls who want something subtle! What It Is: A compact filled with shimmering green, blue, violet, yellow, and red shades to make the perfect rainbow highlight! Why We Love It: No matter how much we swirled all the colors together, the shade that always came up on our cheeks had a pink tint. It was a great highlight for those with darker skin tones, but for fair-skinned girls, we suggest making it a blush topper instead. What It Is: This rainbow-colored powder can not only be used as a show-stopping highlight, but as an eyeshadow too! Why We Love It: The green tint of the highlighter was not what we expected, but it was nonetheless beautiful. It lasted the whole day, although we still wouldn't wear this IRL—on Halloween, maybe? What It Is: Each holographic color in the palette comes in an either cream or powder formula to ensure that your cheeks, lids, and lips are #lit. Why We Love It: When we wore each shade alone, we weren't really into it. But when we mixed them all up, wow! The powder and cream formulas perfectly blended together that you could see our poppin' cheekbones from a mile away. If we had to change one thing, though, it would be the shimmer particles: They could have been more finely-milled. What It Is: The creamy and pigmented highlighters come in cool undertones that will give all skin tones a luminous, pearl-like finish. Why We Love It: With this palette, we really looked like a disco ball—great, if that's your thing! A word of caution: Icy blue or lilac highlighters could look chalky on darker skin tones, so swatch before you buy! What It Is: The creamy yet lightweight formula gives the skin a healthy dose of holographic glow that will actually make you look lit-from-within. Why We Love It: Two words: WET LOOK. It didn't have any shimmer or glitter in it, which we loved, and it really made our cheeks look dewy. BUT, because it was a cream and it's humid here, it didn't last long. Plus, it never really dried up so it stayed tacky throughout the day.